Ask Dr. Copyright -- Are you a SuperLawyer? Ask Dr. Copyright — Are you a “SuperLawyer”? I saw an advertisement in an in-flight magazine that showed the “Top Attorneys”. I’ve seen attorneys who say that they are “SuperLawyers”. 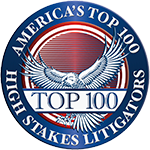 I’ve even seen a listing of “America’s Top 100 High Stakes Litigators”. Can there really be so many great lawyers? The Doc has long been confused by such claims. In the old days (when the Doc passed the Bar Exam), there were rules against most attorney advertising. Claims to be a great lawyer, or to get excellent results for clients were thought to be undignified. There was even a famous case of a Florida divorce lawyer whose television commercial showed one spouse carving up the family sofa with a chain saw, and ended by showing the family basset hound, while the chain saw sound continued. (He was disciplined by the Bar.) Obviously, most of those rules have fallen by the wayside, and what rules remain about how lawyers advertise mainly require that advertisements be truthful, and not promise a positive outcome for clients. The company running the program, America’s Top 100 LLC, states, “It is the mission of America’s Top 100 LLC to recognize annually and on a lifetime basis the most qualified and accomplished professionals in various fields of practice, including attorneys, doctors, dentists, realtors, accountants, engineers, and architects (among other professionals).” They also say on their website, “Membership is limited to the Top 100 professionals from each state*… *Southern California, Northern California, Southern Texas, Northern Texas, Southern Florida, Northern Florida, New York City, Upstate New York, and Washington D.C. are all separated into individual regions”. Now, the Doc can do the math: 50 states, plus a few regions and DC, times 100, times $300 = $1.65 million. Do that for the other specialties and professions (surgeons, plastic surgeons, cataract surgeons, spine surgeons…you get the idea) and it’s BIG BUSINESS. In the Doc’s opinion, it’s also BIG BS. So, Confused, the next time you see an in-flight magazine, the Doc suggests you skip right to the heartwarming story of how nobody ever gets bumped from a flight, loses luggage, or has to pay $9 for a box of stale crackers and cheese food. At least then you will know that you are reading fiction! Need a genuinely great intellectual property attorney? Just call the folks at LW&H. They may not have paid to get that fancy “Top 100” plaque, but that just proves how smart they are!